America’s south. Lively New Orleans, rather sleepy Memphis. Along the Mississippi River. Following the traces of eventful episodes of American history. Events still strongly influencing todays life. A night in Lafayette. Nothing to speak about. Hence, the next morning we’re in desperate need for a more interesting place. To New Orleans. Some 200 km to the east. A highway thru green forest. Mostly flooded. Later for many km on bridges. Crossing swamps and lakes. Then, New Orleans. 1 of the great city of the south. Thus many reasons to experience. Of course, the famous French Quarter to start with. Important to notice, going to the French Quarter also means you’re not alone. There are always a some tourists and locals with you. Should you still feel the absolute need to cuddle up more intensively with other tourists, book a tour. There are 1000s of them. Some making sense, most of them definitely not. Nevertheless, most guides try to be funny enough to be remembered. More important, it seems to be the place where responsible people live. Guys who even bother about the future of the US. Of course, besides stickers on cars it’s the place where you see all these beautifully restored house the Frenchies constructed long time ago. Mostly great town houses. … the choice may be limited and it could happen, that not everything exactly meets your expectations. At least, we suppose the famous stuff they call Etouffée probably has a certain potential for improvement. Who knows. Maybe not at all. Ok. Next extremely important issue for visitors: souvenir shopping. Nothing compares to the very special fashion exclusively developed for New Orleans‌’ visitors. Sorry, forgot the brand. But you’ll find it in all certified boutiques. Should you not like that kind of desirability, no worries. There’s much more. But let’s go back to the marvelous aspects of the French Quarter. The biggest event: Mardi Gras. As we’ve learned an absolute must should you be in town. It’s party the whole night away. Even don’t think about sleeping this night. Accommodation prize is simply not in the reach of ordinary citizens. Then of course the real reason for people visiting this place: music. You find it in the streets, on the sidewalks and of course in many bars. Often it’s jazz, or at least something similar. Should you get slightly tired of Jazz – no problem. There’s a cool bar making music exactly to their customer’s wishes. Of course, in exchange of a couple of bucks. 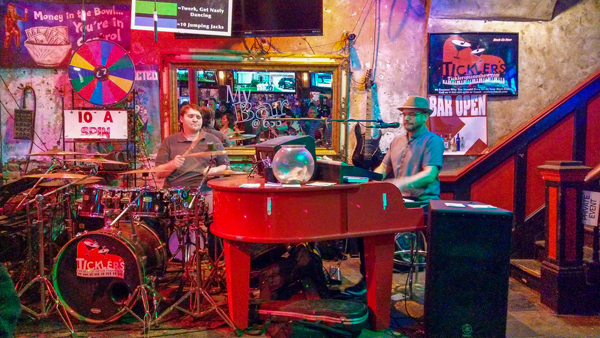 The Tickler’s Piano Bar – simply the loudest in Bourbon Street. And it looks like they have interesting drinks. Definitely, that’s not all New Orleans has to offer. There’s a world outside of the French Quarter and its great fashion. A square especially dedicated to Louis Armstrong. And numerous artists, still to be discovered by the world’s leading galleries. New Orleans is definitely a fascinating place. Although tourists’ life is commercialized to a degree which is often unbearable. And it’s visibly a place with huge social disparity. Posh residences neighboring shantytowns, many homeless people. Thus in closest neighborhood tourist areas and absolute no-go places. After nearly 1 month of driving eastwards, now we head to the north. Along the mighty Mississippi River. … to visit the Barataria Preserve. A world more in the water than ashore. A stroll on the Bayou Coquille Trail. A walk thru wetlands – swamps, forests in the water, lagoons. At this time of the year full of flowers – and anytime of the year full of alligators. Hey girls, if you see these alligators, don’t exclusively think of handbags. Alligator skewers are delicious too. If in Louisiana, a visit to 1 of these famous plantations is inevitable. It’s an important part of history. When visiting, no need to mention that you cannot simply walk in, have a look at the plantation, complain about the restrooms and leave the place again. No, you definitely have to participate in 1 of these super touristic tours. Mostly together with 40 adults and their 80 – 100 unruly kids. We’re happy. When we arrive they just start a tour for Frenchies. And there are not many of them. So, we visit the Laura Plantation. A place where some Frenchy settlers made their fortune with sugarcane. Well, at that time their slaves made the work, the Frenchies the profit. Thus a tour thru the formidable life of the masters and the miserable 1s of their slaves. On the way out, of course a souvenir shop. With all kind of kitsch to remember Laura Plantation. On along the dykes of Mississippi River. Astonishing, the water level is quite above the surrounding area. Near Plaquemine, just a few km south of Baton Rouge, another opportunity to visit the Mississippi Delta. Now with a boat. It’s again a tour. Fortunately we’re the only 1s interested in it. And the guys make it pretty well. It’s The Last Wilderness Swamp Tours. A journey thru the spillways of Mississippi River and flooded forests. In an area currently suffering from 1 of the longest floods in the last 30 years. Great tour. Of course, it’s not primary jungle, but still an opportunity to discover a great landscape. On to Baton Rouge. The proud capital of Louisiana. Absolutely nondescript. A place just to spend the night in a motel at a highway junction. Then northwards. Along the Mississippi towards Vicksburg. On the way a visit to St. Francistown‌ on the shore of the river. Famous for some of the most beautiful Antebellum houses in the region. Visibly a part of the town is flooded. As we learn in recent years that happens every spring. Formerly, floods occurred every 10 years. We suppose we have to consider this another great success of the President’s Great Climate Change Acceleration Program. Back to these Antebellum houses. Further to the north. Crossing into Mississippi State . A short stop in Natchez. Despite its reputation as a jewel of the Mississippi, it rather looks rundown; feels desperate and sad with all these closed shops in the historic downtown. Definitely a candidate for Uncle Don’s current greatification program. In the afternoon in Vicksburg. Looks better than poor Natchez, but still a pretty lonely place. A stroll thru downtown, …. … then the well deserved IPA’n’ Pizza at the Cottonwood Public House. … numerous houses in the water, …. … visibly a region with huge disparities, most villages seem to be very poor and extremely rundown. Looks like an area where Don’s current Make America Great Again Program can make the richer 2% of the inhabitants even richer in favor of the other guys. Late afternoon in Memphis. A rather small town. Known to be a place with a pretty crazy mix of opulent lifestyle next to blatant poverty. And known as the place where Elvis lived. We don’t come here to visit Graceland. Sorry guys, Elvis is great – but probably more for other people than us. A stroll thru Memphis’ downtown – not a very lively place – to Hotel Peabody. The ultimate place if you want to see ducks in the lobby’s fountain. As there are not too many other hotels offering these exquisite facilities for ducks, 100s of tourists visit every day when the poor ducks have to take the elevator from the lobby fountain to the hotel’s rooftop for their well deserved’n’all relaxing sleep. On to Beale Street – a kind of entertainment district for locals and bored tourists. A pretty compact area, with a number of music bars’n’restaurants. Mostly pretty expensive for what they offer, a few 1s quite ok.
Memphis is another town famous for its murals. Should you – just by chance – sneak thru Memphis, don’t miss them. They’re mainly on the walls of rather run-down houses in side alleys. Evening: of course you have to go to a music bar in Beale Street. Just avoid those bars addicted to 20$ beers. We discover the BB King Blues Club. Even if blues is not your favorite, it’s worth the visit. The next morning we have the difficult decision on what to do . Despite all temptations of Memphis, we opt to walk to Motel Lorraine. The place Martin Luther King was murdered in 1968. An astonishing place. Especially, when you learn, that the system lived every day and defended over years by great parts of the population doesn’t differ that much from the situation in South Africa at that time. They just call it segregation. Of course, it was officially not sanctioned by the US Government. Nevertheless, few efforts could be seen to establish and implement existing laws. A part of history few Americans speak about. A visit to the oldest restaurant in town: the Arcade Cafe. After all that something really weird. Evidently, Memphis offers it. The Pyramid. Formerly built as a sports arena, nowadays occupied by an indoor hotel (built with pine wood logs) and the outdoor’n’hunting shop Bas Pro. Well, the shop is definitely more about hunting than anything else. Largely looking like a supply depot for any army in the 3rd world. To make the whole affaire more kid-friendly all these arms’n’uniforms are surrounded by fabric animals and decorated like an X-max market. Hey guys, enough of this stuff. Don’t you think so. Yet, those in desperate need for the next post, kindly do not desperate. It will be released soon. Wish you an awesome reading.